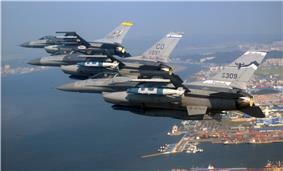 Air National Guard F-16 Fighting Falcon fighters fly over Gunsan, South Korea. The tailflashes denote the aircraft from being from the New Mexico, Colorado and Montana ANGs. The Air National Guard (ANG), also known as the Air Guard, is a federal military reserve force as well as the militia force of each U.S. state, the District of Columbia, the Commonwealth of Puerto Rico, and the territories of Guam and the U.S. Virgin Islands. It, along with each state's Army National Guard component, makes up the National Guard of each state. ANG units typically operate under Title 32 USC. However, when operating under Title 10 USC all ANG units are operationally-gained by an active duty USAF major command (MAJCOM). ANG units of the Combat Air Forces (CAF) based in the Continental United States (CONUS), plus a single air control squadron of the Puerto Rico ANG, are gained by the Air Combat Command (ACC). Conversely, CONUS-based ANG units in the Mobility Air Forces (MAF), plus the Puerto Rico ANG's airlift wing and the Virgin Islands ANG's two support squadrons, are gained by the Air Mobility Command (AMC). The vast majority of ANG units fall under either ACC or AMC. However, there remain a few exceptions, such as the Alaska ANG, Hawaii ANG and Guam ANG, whose CAF and MAF units are operationally-gained by Pacific Air Forces (PACAF), while a smaller number of ANG units in CONUS are operationally-gained by Air Education and Training Command (AETC), Air Force Global Strike Command (AFGSC), Air Force Special Operations Command (AFSOC), Air Force Space Command (AFSPC), and United States Air Forces in Europe - Air Forces Africa (USAFE-AFAFRICA). Established under Title 10 and Title 32 of the U.S. Code, the Air National Guard is part of the state National Guard and is divided up into units stationed in each of the 50 states, the District of Columbia, and three U.S. territories. Each state, the District of Columbia and the Commonwealth of Puerto Rico have at least one Air National Guard wing level unit with a flying mission, while the Air National Guard in Guam and the U.S. Virgin Islands are strictly non-flying support organizations. When not in a "federal" status, the Air National Guard operates under their respective state governor or territorial government. The exception to this rule is the District of Columbia Air National Guard (DC ANG). As a federal district, the units of the DC ANG are under the direct jurisdiction of the President of the United States though the office of the Commanding General, District of Columbia National Guard. In their "state" role, the Air National Guard may be called up for active duty by the state governors or territorial commanding generals to help respond to domestic emergencies and disasters, such as those caused by hurricanes, floods, fires, and earthquakes. In the case of the DC Air National Guard, the Adjutant General of the District of Columbia reports to the Mayor of the District of Columbia, who may only activate DC ANG assets for local purposes after consulting with the President of the United States. With the consent of state governors or equivalents, members or units of the Air National Guard may be appointed, temporarily or indefinitely, to be federally recognized members of the armed forces, in the active or inactive service of the United States. If federally recognized, the member or unit becomes part of the Air National Guard of the United States, which is one of two reserve components of the United States Air Force, and part of the National Guard of the United States. Because both state Air National Guard and the Air National Guard of the United States relatively go hand-in-hand, they are both usually referred to as just Air National Guard. Air National Guard of the United States units or members may be called up for federal active duty in times of Congressionally sanctioned war or national emergency. The President may also call up members and units of the Air National Guard using a process called "federalization", with the consent of state governors or equivalents, to repel invasion, suppress rebellion, or execute federal laws if the United States or any of its states or territories are invaded or is in danger of invasion by a foreign nation, or if there is a rebellion or danger of a rebellion against the authority of the federal government, or if the president is unable to execute the laws of the United States with the regular armed forces. The United States Air National Guard has about 110,000 men and women in service. Like the Air Force Reserve Command (AFRC), the ANG is often described as a "reserve" force of "part-time airmen," although the demands of maintaining modern aircraft mean that many AFRC and ANG members work full-time, either as full-time Air Reserve Technicians (ART) or Active Guard and Reserve (AGR) personnel. Even traditional part-time air guardsmen, especially pilots, navigators/combat systems officers, air battle managers and enlisted aircrew, often serve 100 or more man-days annually. As such, the concept of Air National Guard service as representing only "one weekend a month and two weeks a year" is not necessarily valid. The Air National Guard (ANG), in tandem with the U.S. Air Force's other reserve component, the strictly "federal" Air Force Reserve Command (AFRC), comprise the "Air Reserve Component" of the U.S. Air Force under the "Total Force" construct. Many ANG pilots work for commercial airlines, but in the ANG they may train to fly any of the aircraft in the USAF inventory, with the current exception of the Kansas Air National Guard previously flew the B-1B Lancer prior to converting to the E-8 Joint STARS and KC-135R Stratotanker, respectively. In addition, the 131st Fighter Wing of the Missouri Air National Guard recently transitioned from flying the F-15C/D Eagle at St. Louis International Airport/Lambert Field Air National Guard Station to the B-2 Spirit at Whiteman AFB as an "Associate" unit of the Regular Air Force's 509th Bomb Wing and was re-designated as the 131st Bomb Wing. In 2012, General Norton A. Schwartz, the then-Chief of Staff of the Air Force, defended cutting nearly twice as many service members from the Air National Guard and the Air Force Reserve as from the active duty USAF, in order to maintain the service's surge and rotational capabilities in the active duty Regular Air Force. These proposals were eventually overruled and cancelled by the U.S. Congress. The Air National Guard Readiness Center, a field operating center of the United States Air Force at Joint Base Andrews, Maryland, performs operational and technical functions to ensure combat readiness of Air National Guard units and is a channel of communication between the Air Force and the National Guard Bureau regarding readiness and operations. Air National Guard units are trained and equipped by the United States Air Force. The state ANG units, depending on their mission, are operationally gained by a Major Command of the USAF if federalized. In addition, personnel and equipment are routinely federalized and deployed by the USAF as part of Air and Space Expeditionary Forces, and are currently engaged in combat operations under United States Air Forces Central (USAFCENT) as part of the Global War on Terrorism. The modern day National Guard in the United States traces its origins to December 13, 1636, when the Massachusetts Bay Colony's General Court passed an act calling for the creation of three regiments, organizing existing separate militia companies in and around Boston. The creation of the militia regiments was caused by the perceived need to defend the Bay Colony against American Indians and from other European countries operating in North America. This organization formed the basis of subsequent colonial and, post-independence, state and territorial militias which later became the Army National Guard. Being "local" ground forces affiliated with the Army, militias were considered state-centric/territorial-centric in nature, this versus naval forces, which were considered wholly activities of the federal government. This distinction accounts for why there are no National Guard components in the U.S. Navy, U.S. Marine Corps or U.S. Coast Guard. Because the present day U.S. Air Force evolved from the U.S. Army, it was only natural that a separate Air National Guard would be established with the divestiture of the former U.S. Army Air Forces and its establishment as a separate and independent U.S. Air Force in 1947. A Galludet Tractor biplane which the New York National Guard aviators rented in 1915. ^ Weisgerber, Marcus. "USAF Chief: Proposed Guard Cuts Necessary To Protect Surge Capability." Defense News, 12 June 2012. ^ Michael E. Capuano (2002). "Introducing a Joint Resolution Honoring the 102nd Fighter Wing of the Massachusetts Air National Guard". This is a list of the senior leaders or Generals of the Air National Guard. The title has changed over time: The Assistant Chief, National Guard Bureau for Air,; Chief, Air Force Division, National Guard Bureau; Director Air National Guard. In the spring and summer, the 109th heads toward the North Pole where it supports the National Science Foundation and several other nations in Greenland and above the Arctic Circle. The New York Air National Guard's 109th Airlift Wing operates ski-equipped LC-130 Hercules transports that fly into arctic regions. 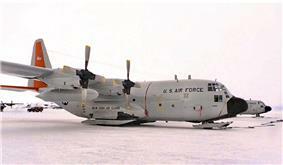 In 2006, two LC-130s closed the 2006 Operation Deep Freeze located at McMurdo Station near the South Pole. The mission ended because the temperature dropped to almost minus −50 °F (−46 °C) in three days. Since 1988, the squadron had provided the air supply bridge to McMurdo, landing with wheels on an ice runway near the station. However, as it got colder, the ski-equipped LC-130s landed on a snow-covered skiway on the Ross Ice Shelf a few miles from the station. The Air National Guard also participates in noncombat support missions that sometimes take it beyond the U.S. boundaries. For example, in Operation Winter Freeze, from November 2004 through January 2005, nearly 250 Army and Air National Guardsmen provided assistance to U.S. Customs and Border Patrol (CBP) along 295 miles of the United States-Canadian border. That operation included military personnel from U.S. Northern Command's Joint Task Force North who helped the Border Patrol to, "...keep potential terrorists out of the country and to break up smuggling rings that try to get them in." [In order] to detect, deter, and monitor suspicious actions … Air Guard crews flew twin-engine, C-26 airplanes out of Syracuse, New York"
To support rescue and relief operations in New Orleans, the Air National Guard used Naval Air Station Joint Reserve Base New Orleans, in Belle Chasse, Louisiana, on the Mississippi River's West Bank. Within five hours of its orders, the 136th Airlift Wing of the Texas Air National Guard deployed 41 Air National Guardsmen to Belle Chasse. Less than 24 hours later, a C-130H landed at the air station with members of the Louisiana Air National Guard's 159th Fighter Wing. Soon more aircraft arrived, delivering troops and supplies for New Orleans; offloaded pallets were stacked 10 deep on the aircraft parking ramp. Instead of heading into the flooded city, the 136th team remained at Belle Chasse and, within 36 hours of arriving, it established a fully functioning Air Terminal Operations Center and was keeping pace with the demanding mission schedule. That Aerial Port team, augmented by U.S. Navy cargo handlers and members of the 133d Aerial Port Squadron, 133d Airlift Wing of the Minnesota Air National Guard, handled over 124 missions with 1.5 million pounds of cargo and 974 passengers in one day. As one of its most crucial tasks, the Texas squadron downloaded the German pump system used to drain the city of New Orleans because its own pumps were inundated. It also uploaded two KC-135s with 140 kennels filled with rescued dogs bound for adoption in Arizona. ANG personnel arrived on the Gulf Coast on 29 August, a few hours after the storm's arrival. Personnel from the Florida Air National Guard's 209th RED HORSE Squadron of the 125th Fighter Wing were some of the first to enter the area. Seventy-three engineers from this unit worked in hard-hit Hancock County, Mississippi. Initially establishing a basecamp for other emergency personnel, the unit began repairs in Hancock County communities working nearly around-the-clock on multiple construction projects to restore power, clean and repair schools, and refurbish electrical supplies. As a Florida unit, the 209th had worked many other hurricanes. However, Katrina's devastation surpassed anything in their previous experience. By the time Katrina made landfall, the Air National Guard had mobilized 840 personnel in Florida, Mississippi, Louisiana, and Texas. Although the Air National Guard had a domestic mission to support local authorities in rescue and relief operations following a natural disaster, its utilization for such missions had been limited primarily to a select group of career fields such as civil engineers, medical personnel, and services. In response to Hurricane Katrina, ANG units in all 54 states and territories responded to the recovery efforts in the Gulf States, with the Mississippi Air National Guard's Jackson Air National Guard Base serving as a hub and operating location for numerous active duty, Air National Guard, Air Force Reserve, Naval Reserve and Army National Guard aircraft. The ANG flew 73 percent of the airlift for the relief operations including its brand new C-130J and C-17 Globemaster III aircraft. In addition, ANG Combat Search and Rescue pararescuemen and Combat Controllers saved over 1,300 victims. On 29 August 2005, the largest natural disaster the Air National Guard faced in its then 58-year history began when Hurricane Katrina hit the United States Gulf Coast. The most severe damage came from a 30-plus-foot storm surge along the Mississippi coast and the north shore of Lake Pontchartrain in Louisiana and breaks in the levies along a canal in New Orleans. Several weeks later Hurricane Rita devastated portions of western Louisiana and eastern Texas, and then the less severe Hurricane Wilma damaged Florida. Blizzards also created the need for National Guard support. Often both Army National Guard and Air National Guard units assisted with health and welfare matters, conducted debris removal and power generation, and provided supply and transportation support in connection with snowstorms. For example, a Christmas-time 2006 blizzard at the airport hub of Denver International Airport closed that facility down for two days. Army and Air National Guardsmen took food and water to thousands of travelers trapped there. In the same storm, western Kansas received between 15 and 36 inches of snow with drifts as high as 13 feet. The Air National Guard not only assisted people, but also dropped bales of hay to feed stranded cattle. The Air National Guard's main tool for fighting forest fires is the Modular Airborne Fire Fighting System (MAFFS), which has undergone several updates since its first use in September 1971 by the California Air National Guard's then-146th Tactical Airlift Wing and the North Carolina Air National Guard's then-145th Airlift Wing. Housed in C-130s, MAFFS could disperse up to 27,000 pounds...almost 3,000 gallons...of commercial fire retardants or an equivalent amount of water. Newer aircraft like the C-130J carry the MAFFS II, which carry even more fire retardant, can disperse it more rapidly over a wider area, and is easier to recharge after a mission than its predecessor. 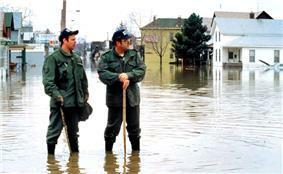 Traditionally, governors called out National Guard units when faced with natural but localized disasters such as blizzards, earthquakes, floods, and forest fires. The president could also federalize them in major disasters that threatened to overwhelm the resources of individual states or communities. According to the National Guard Bureau, "The indigenous skills and capabilities National Guardsmen to respond to natural disasters are the same skills and capabilities that enable us to successfully respond to potential terrorist threats." Members of the Indiana Air National Guard participate in an emergency operation after recent flooding in Fort Wayne, Indiana, 1 March 1982. 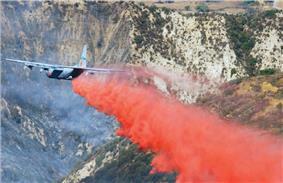 C-130E Hercules cargo aircraft from the 146th Airlift Wing, California Air National Guard, rigged with a Modular Airborne Fire Fighting System (MAFFS) makes a Phoschek fire retardant drop on the Simi Fire in Southern California, 28 October 2003. The Iraqi conflict continued through 2011 and the Air National Guard continued its involvement. By 2004 nearly 40 percent of the total Air Force aircraft deployed for overseas operations were assigned to the Air National Guard. The ANG supported Air Expeditionary Force deployments to Iraq throughout the 2000s, until the United States removed its forces from the country. The Air National Guard also deployed air traffic control personnel, maintainers, and airspace managers. Over 27 percent of the total Air Force civil engineering force in Iraq came from the ANG; other Air Guard engineers supported Iraqi Freedom while operating in several other countries. As essential to the war effort as were C-130s, A-10s, and piloted reconnaissance and surveillance aircraft, they could not have completed their missions efficiently without aerial refueling. During the war in Iraq, the Air Force deployed 200 tanker aircraft based at 15 locations. Air National Guard KC-135 tankers provided one-third of the Air Force refueling aircraft deployed for Operation Iraqi Freedom, and an additional 35 ANG tanker aircraft conducted air bridge operations. As in Afghanistan, the Air National Guard contributed significant airlift capability to Operation Iraqi Freedom. Thirteen of ANG's 25 airlift units participated, including 72 of 124 Air Force C-130s. Among their missions, Air National Guard C-130 crews airlifted elements of the 82d Airborne Division and the 3d Marine Expeditionary Force. Those crews also flew one of the first day/night airlift missions into an Iraq air base and delivered the first humanitarian supplies into Baghdad International Airport. During Operation Iraqi Freedom's first six months, Air National Guard C-130 crews airlifted 22,000 tons of cargo, 47,000 passengers, and flew 8,600 sorties in 21,000 hours. The 193d Special Operations Wing of the Pennsylvania Air National Guard deployed its EC-130 Commando Solo aircraft for a variety of PSYOPS support to coalition agencies in Iraq. Flying from March to June 2003, its missions apparently fulfilled their goals. According to an Iraqi prisoner of war and former mid-level intelligence officer, the population in southern Iraq considered the coalition radio broadcasts more truthful than state-owned media. The leaflets also had a significant impact on the morale of Iraqi military and prompted considerations to surrender. The Iraqis concluded that U.S. planes could as easily target them with bombs as leaflets if their intent was lethal. Operation Iraqi Freedom's intelligence collection efforts were enhanced by the initial combat employment of the Air Force's first and only "blended" wing: the newly formed E-8 Joint STARS weapon system. Air National Guard intelligence personnel deployed overseas and supported the war effort in signals intelligence by flying Senior Scout missions and augmented RC-135V/W Rivet Joint ELINT crews to "monitor the electronic activity of adversaries." Although their pilots sat at controls in the United States, Air National Guardsmen also "flew" RQ-4 Global Hawk and MQ-1 Predator unmanned aerial vehicle intelligence missions in Southwest Asia. Commando Solo EC-130E from the 193d Special Operations Wing, Pennsylvania Air National Guard, sits on the ramp at undisclosed location during Operations Enduring Freedom and Iraqi Freedom in late 2005. During the twelfth day of the siege, the outnumbered Rangers continued to face repeated attacks by the enemy force. The Air National Guard A-10 and F-16 pilots realized early in the battle that the close air support they provided was the vital element that kept the Iraqi forces at bay, a matter of life and death for the Rangers. In the end the coalition forces prevailed. 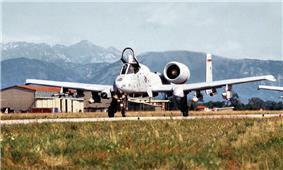 Military experts believed that without the air support, especially the A-10s, the Rangers would not have won the battle. Not only did the coalition forces secure the Haditha Dam complex, but they seriously reduced the fighting effectiveness of the Iraqi Armored Task Force in the Haditha area. The Rangers on the dam were greatly outnumbered. Nevertheless, the combined efforts of a Forward Air Controller-qualified pilot (FAC), a Combat Search and Rescue (CSAR) pilot, and observation posts manned by additional Rangers and Air Force enlisted terminal attack controllers (who cleared airborne weapons for release) ensured the Rangers on the dam would not be overrun. That operation reflected the typical attitude held by Air National Guard aviators, especially A-10 pilots, who believed that when ground troops needed help, the pilots would remain as long as possible to, "...lay it on the line more and expose themselves more over the target area." Even when the Rangers were not taking enemy fire, the A-10s provided cover so the Rangers could catch a few hours of sleep. 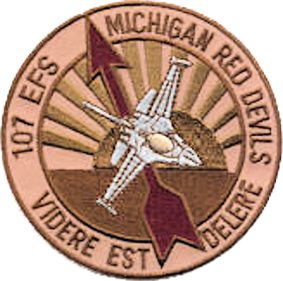 The 410th fighters also supplied air cover during medical evacuation missions for killed and wounded Rangers. AH-6 helicopters of the 160th Special Operations Aviation Regiment and F-16s from the 410th AEW provided air cover as the Rangers took their convoy to Haditha. During the night of 1 April 2003, with support from the 410th, the Rangers seized the dam, a power station, and a transformer yard while facing light to moderate enemy resistance. Several Iraqis were killed and wounded; others, including 25 civilian workers, were taken prisoner. As daylight broke over the dam, the Rangers began taking increasing enemy fire from the south as well as coordinated attacks at both ends of the dam. Although the Rangers repelled the initial assault, Iraqi counterattacks continued with heavy mortar and artillery shells that rained down on the Rangers. Fortunately, the Rangers had ample air support from the 410th which attacked several mortar positions. Even without the protection of darkness, the Air National Guard A-10s attacked numerous enemy positions. 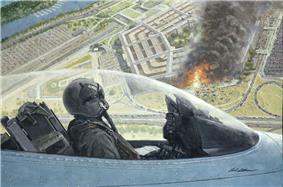 At nightfall the Iraqis resumed their attacks against the Rangers, but once again close air supported the U.S. forces. A single bomb obliterated the attackers and shattered every window in the dam complex. Nevertheless, the siege continued for ten more days. The Rangers expected the dam to be well defended. In preparation for the assault on the dam, fighters assigned to the 410th Air Expeditionary Wing (AEW) conducted preparatory air strikes against Iraqi forces in the dam's vicinity. Air support for Special Forces in the battle came from various coalition aircraft including U.S. Army Special Operations Aviation units. However, that battle became one of the more unique operations for the AEW, and in particular, Air National Guard pilots. The 410th was responsible for providing combat search and rescue capability for western and central Iraq. During the month-long air campaign over the western Iraqi desert, the A-10 and F-16 Air National Guard pilots assigned to the AEW were involved in countless missions supporting Special Forces teams in need of close air support. The highly experienced Air National Guard pilots assigned to the AEW, especially the A-10 pilots, helped insure the successful employment of close air support for friendly forces fighting to retain the Haditha Dam. As operations began, Army Rangers embarked on a mission to protect the Haditha Dam from being destroyed by Iraqi forces. The Rangers expected the operation to last approximately 24 hours. Instead it took them more than 12 days. The dam is a critical source of water and electrical in western Iraq. If the Iraqis succeeded in blowing up the dam, the releasing waters would flood the down-river areas, causing a humanitarian and environmental disaster. Munitions personnel from the 160th Fighter Squadron, 187th Fighter Wing, Alabama Air National Guard, assigned to the 410th Air Expeditionary Wing at a forward deployed location work on guided munitions on the pylon of one of their F-16C Fighting Falcons. The Falcon has an AIM-120A Advanced Medium Air-to-Air Missile fixed to the wing tip. The 410th Air Expeditionary Wing prepares the aircraft for take off for sorties on A-Day, the commencement of the air war for Operation Iraqi Freedom, 19 March 2003. On 18 March 2003, the United States and coalition forces launched the invasion of Iraq in order to remove Saddam Hussein's regime from power, the invasion being designated Operation Iraqi Freedom. The ANG provided a robust force of over 3,530 personnel for the expeditionary combat support functions and many Air Guard senior officers held command positions during the war. Once the Iraq conflict began in March 2003, the military began to reduce its resources in Afghanistan. Yet the reliance on using the Air National Guard and Air Force Reserve units, aircraft and personnel there continues to the present supporting the combat operations under United States Air Forces Central (USAFCENT). Air National Guardsmen and aircraft deploy to Afghanistan routinely as part of the Air Expeditionary Units at bases there. 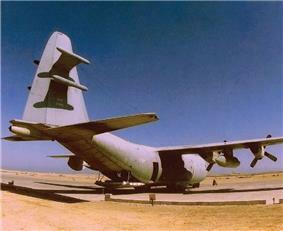 By March 2002, ANG C-130 units had flown 55 percent of the missions for the Afghanistan war. The 193d Special Operations Wing of the Pennsylvania Air National Guard, using the EC-130E Commando Solo aircraft, performed an unusual mission in Afghanistan: psychological operations (PSYOPS). Since 1968, the 193d had been handling airborne psychological operations missions. The EC-130E acquired the mission name Commando Solo during the 1990s, when the aircraft was modified to handle color television operations. One of the first ANG flying units deployed to the area, the 193d began transmitting by the end of October 2001. For almost six months the unit relayed broadcasts of Voice of America in the Dari and Pashtu languages and Radio Free Europe/Radio Liberty in Uzbek, Tajik, and Persian. According to a White House spokesman, the Commando Solo missions gave the Afghan people "full knowledge about what is happening in Afghanistan from a source other than a repressive Taliban regime." The 193d remained in the region until ground psychological warfare operations stations were safely established. Approximately 10 minutes after the Rangers took control of the hill, they began to receive more frequent enemy mortar and automatic weapons fire. Although combat air support prevailed, the enemy wounded an Army medic and fatally wounded Airman Cunningham. At that point the Quick Reaction Force had 11 wounded and seven dead. After 17 hours on the mountaintop, a nighttime rescue took place and the ordeal was over. Operation Anaconda continued for another 19 days. According to Sergeant Miller, "We continued to treat the patients, continued moving ammunition and grenades to where they were needed. I grabbed a radio … and set up satellite communication and then returned to the rear." Tech Sergeant Miller and Senior Airman Jason Cunningham, like Miller, a pararescueman, worked hard to keep the patients from succumbing to hypothermia. They put them in the helicopter and removed its insulation and wrapped it around the wounded Rangers. In addition, they used the majority of the fluids available in the medical kits and anything else, including the heaters packed in their food rations. With the help of the additional Rangers and more air strikes, they took the hill, killing many al Qaeda combatants. They also recovered the bodies of Petty Officer Roberts and Sergeant Chapman. Regardless of the danger they knew the al Qaeda would treat Roberts badly and time was running out for him. Despite intense ground fire, the six men successfully returned to Takur Ghar. Nevertheless, the battle continued and Sergeant Chapman was killed along with several enemy fighters. Surrounded by gunfire, the men on the ground called upon a Quick Reaction Force (QRF), designed for such emergencies. Those forces consisted of 23 men and two helicopters. The team included Tech Sergeant Miller. "We were notified that we would be launching in 45 minutes," he recalled, "and were going into [an al Qaeda and Taliban] infested area." Also on the team were Army Rangers. 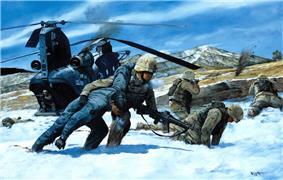 During Operation Enduring Freedom, Rangers and special operations formed the focal point of the U.S. ground campaign. Because of communications failures, the Quick Reaction Force landed in the same spot as the previous helicopters and, like them, was greeted with gunfire. Miller's helicopter managed to land, and the QRF called in close air support. For the next five and a half hours, they battled with the enemy. Three Rangers died and others were wounded. One helicopter carried a Navy SEAL team and an Air Force combat controller, Technical Sergeant John Chapman. As the SEAL team disem-barked, automatic weapons fire laced the helicopter's side while a rocket propelled grenade ripped into it. The crew chief yelled, "We're taking fire! Go! Go! Go!" and the SEAL team rushed back inside. As the pilots added power to evade the heavy ground fire, the damaged helicopter bucked violently, causing Navy SEAL Petty Officer 1st Class Neil Roberts, who was standing on the ramp, to fall about 12 feet to the ground below. The helicopter escaped the ambush and crash-landed about seven kilometers north of where Petty Officer Roberts fell. The second helicopter rescued the other SEALs and Sergeant Chapman but after returning to their base, they decided to try and rescue Petty Officer Roberts. For Operation Anaconda, its commander, Army Major General Franklin L. Hagenbeck, directed coalition forces, U.S. soldiers and Afghan forces, to destroy remaining al Qaeda and Taliban forces in an area located roughly 65 nautical miles south of the Afghan capital, Kabul. One reconnaissance team in two helicopters landed on Takur Ghar, Ghar, a snowcapped, 10,200-foot mountain where temperatures at the top reached 40 °F (4 °C) during the day and dropped to a negative five at night. The Pennsylvania Air National Guard's 103d Fighter Squadron of the 111th Fighter Wing, became the first A-10 ANG unit to deploy directly to Afghanistan. From December 2002 to January 2003, the 111th Fighter Wing deployed personnel and sent its aircraft to Bagram Air Base, Afghanistan to carry out ground support missions for both United States as well as Afghan Northern Alliance ground forces. 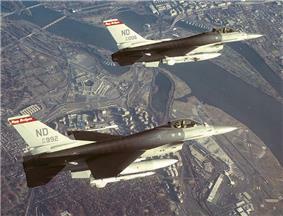 In March 2003, the 104th Fighter Squadron of Maryland's 175th Wing deployed to Afghanistan. While there, it flew all the A-10 combat missions for Operation Enduring Freedom. The 169th Fighter Wing, South Carolina Air National Guard, was the first ANG fighter unit to deploy to Southwest Asia in direct support of the air war over Afghanistan. It sent over 200 personnel and six F-16CJs in January 2002 to Al Udeid Air Base in Doha, Qatar, to assist air combat operations over Afghanistan. In particular, they provided Joint Direct Attack Munitions (JDAMs) against Taliban and al Qaeda positions, the only Air Force fighter unit in the theater to do so. F-16s sometimes were also configured for Cluster Bomb Units (CBUw). In addition, F-16 pilots sometimes fired their 20mm gun against ground targets. Missions could last up to 10 hours with multiple air refuelings. After so many hours strapped in their seats, pilots generally received one to three days of crew rest. The unit returned to South Carolina on 3 April 2002. When the war began, only Air National Guard units assigned to Air Force Special Operations Command (AFSOC) deployed directly to Afghanistan to support combat operations. Typically, ANG special operations units in 13-man teams first went to active duty bases in the United States, and later to overseas locations. The Air National Guard contributed two C-141 Starlifter units, the 155th Airlift Squadron / 164th Airlift Wing, Tennessee Air National Guard; and the 183d Airlift Squadron / 172d Airlift Wing, Mississippi Air National Guard, to the strategic airlift mission. The Air National Guard's sole C-5 Galaxy unit, the 137th Airlift Squadron / 105th Airlift Wing, New York Air National Guard at Stewart Air National Guard Base in Newburgh, New York, also contributed to the operation. Through the ANG's airlift participation in Europe, the Regular Air Force and Air Force Reserve (Associate) C-17 Globemaster IIIs could support Enduring Freedom directly. Shortly after the terrorist attacks on 9/11 and weeks before the first U.S. bomb was dropped over Afghanistan, the Air Force established air bridges to help funnel material and personnel overseas to support multiple operations in conjunction with Enduring Freedom. Air National Guard tanker units received orders by 20 September 2001, to be in their deployed locations before the start of their air bridge operations. Some ANG tanker units also flew humanitarian support missions. By using European bases, the Air Force could transfer cargo from the larger aircraft to smaller planes, refuel aircraft on the ground, exchange flight crews, give crews rest opportunities, and repair broken aircraft. The ANG was involved even before the fighting in Afghanistan began. With the war imminent, the Air Force quickly established an airlift operations plan that included active duty, Guard, and Reserve components. It became one of the most extensive operations in Air Force history. 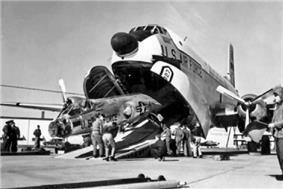 Furthermore, the Air Force met the logistical needs of that operation despite the severe shortage of strategic airlift and troublesome maintenance needs of the older planes. On 20 September 2001, President Bush told a televised joint session of Congress and the American people that Osama bin Laden and his al Qaeda network were responsible for the recent terrorist attacks on the United States. The refusal of the Taliban to comply resulted in the United States taking military action to achieve the president's demands, the action given the name Operation Enduring Freedom. 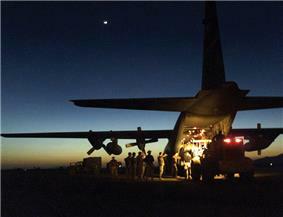 Personnel assigned to the 321st Air Expeditionary Squadron offload supplies from a C-130H Hercules aircraft assigned to the 187th Airlift Squadron, 153d Airlift Wing, Wyoming Air National Guard, at Kandahar, Afghanistan, during Operation Enduring Freedom. Combat Air Patrols (CAPs) began to be flown 24/7 over major cities in the United States. ANG squadrons at 26 bases were put at tremendous strain to support the operations. The Air National Guard ran continuous round-the-clock combat air patrols over New York City and Washington, D.C., until spring 2002. In addition, when key events occurred such as the 2002 Winter Olympics in Utah, space shuttle launches in Florida, baseball's World Series and football's Super Bowl, similar air patrols helped provide security. The Air National Guard also flew random patrols over various urban areas; nuclear power plants; major military installations such as MacDill AFB, Florida, Peterson AFB, Colorado, Offutt AFB, Nebraska and Scott AFB, Illinois that were home to various combatant command headquarters; weapons storage facilities and laboratories. Because estimates of the nation's security situation became more optimistic, in spring 2002, the Air Force eliminated the continuous patrols and substituted random ones by the summer. Guardsmen gained national visibility starting 27 September when President George W. Bush asked the governors for their temporary help at commercial airports, which had reopened a few days after 9/11 with new security restrictions. In the airports they would "Temporarily augment the civilian airport security function of the nation's commercial airports with a trained, armed, and highly visible military presence." For more than seven months, several thousand Guardsmen performed those security duties, with additional Guardsmen called into service during the Thanksgiving, Christmas, and New Year holiday period. Although the Army Guard provided the vast majority of the enhanced airport security force, several hundred Air National Guard personnel also participated. As a result of the September 11 attacks in 2001, homeland defense became the top national defense priority the enhanced defense of North America and military support to civilian government agencies, known as Operation Noble Eagle, began early the next day. "Whereas on the morning of 11 September 2001, the 102nd Fighter Wing of the Massachusetts Air National Guard became the Nation's first airborne responder to the terrorist attacks of that day when it scrambled two F-15 fighter aircraft just six minutes after being informed of the terrorist hijackings of commercial airliners". In accordance with established NORAD procedures, the F-16s were initially directed to head northeast to avoid some of the most heavily traveled commercial airline routes rather than to fly directly to the Washington, DC, area. Major Dean Eckmann and Major Brad Derrig, plus Captain Craig Borgstrom of the 119th Fighter Wing were directed to fly at maximum subsonic speed, 660 miles per hour. At about 40 miles away, they saw the billowing smoke of American Airlines Flight 77, which had crashed into the Pentagon at 9:43 am. As the North Dakota Air Guardsmen neared Washington, DC, Major Eckmann, the flight lead, set up a patrol over the nation's capital with the help of air traffic controllers at the Northeast Air Defense Sector. At 9:09 am the pilots of the North Dakota Air National Guards F-16s of the 119th Fighter Wing were standing by, ready to launch, at their forward alert operating location at Langley AFB, Virginia, located about 130 miles southeast of Washington, DC. They were at their battle stations because of a growing general concern about the situation that morning. Seven minutes later, the FAA reported that United Airlines Flight 93, outbound from Newark, New Jersey, to San Francisco, California, might also have been hijacked. The FAA notified the Northeast Air Defense Sector eight minutes later that American Flight 77, a flight from Dulles International Airport, Virginia, near Washington, DC, to Los Angeles, California, also appeared to be the victim of hijackers. At 9:24 am Colonel Marr ordered three F-16s (two alert aircraft and a spare) scrambled from Langley AFB to check out an unidentified intermittent aircraft track heading toward Washington DC. In six minutes, the Langley F-16s were airborne. At 8:38 am, the Federal Aviation Administration (FAA) in Boston, Massachusetts, reported a possible hijacking and called the Otis Air National Guard Base control tower on Cape Cod, home to the Massachusetts ANG's 102d Fighter Wing, to request military assistance. At that time, Major Dan Nash and Lieutenant Colonel Tim Duffy had air defense alert duty for the 102d. At 8:40 am Colonel Bob Marr, a Massachusetts Air National Guardsman serving as NORAD's Northeast Air Defense Sector commander, learned from the FAA that American Airlines Flight 11 might have been hijacked. The two pilots immediately suited up and headed for their F-15s. Marr ordered Nash and Duffy into the air; their F-15s were airborne within six minutes and as directed, headed for New York City, 153 miles away. Unknown to the pilots, American Airlines Flight 11 had crashed into the North Tower of the World Trade Center in New York City just as Colonel Marr was delivering his order. Meanwhile, at 8:43 am, the FAA reported another possible hijacking to the Northeast Air Defense Sector. That was Boston to Los Angeles United Airlines Flight 175. At 9:02 am, with the F-15s still 71 miles away, that plane crashed into the World Trade Center's South Tower. The defining events for the Air National Guard (ANG) as well as for the United States occurred with the al Qaeda attacks of 11 September 2001 on the World Trade Center in New York City and the Pentagon in Washington, D.C. The only air defense fighter units stationed within the entire northeastern United States belonged to the Air National Guard. 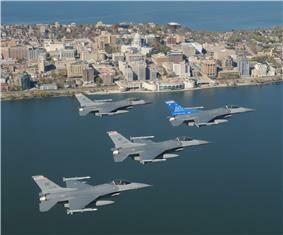 F-16s of the 119th Fighter Wing, North Dakota Air National Guard, fly a combat air patrol over Washington, DC, and the Pentagon in Operation Noble Eagle. November 2001. 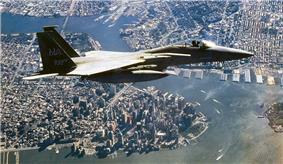 An F-15C Eagle from 102d Fighter Wing, Massachusetts Air National Guard, flies a Combat Air Patrol over New York City as part of Operation Noble Eagle. F-15s from the 102d were the first to arrive on scene over the World Trade Center following the 11 September 2001, terrorist attacks. In August 1998, the Air Force inaugurated a new concept. Based on experiences during the Persian Gulf War and numerous deployments to the Balkans and other contingency operations, it organized more than 2,000 aircraft, including those of Air Force Reserve and Air National Guard units, into 10 Air Expeditionary Forces (AEFs), later designated as the Aerospace Expeditionary Forces, and, in 2007, the Air and Space Expeditionary Forces. AEFs would rotate in order to ease the strain of increased post-Cold War operations overseas. The AEF promised to spread the burden of deployments more widely among flying units, Active Duty, Air Force Reserve or Air National Guard. Moreover, the timing of rotations became more predictable. Greater predictability would enable Airmen to better manage the competing demands of families, civilian careers, and military service. Air National Guard aviation units would be expected to deploy overseas once every 15 months while support units would do so at 30-month intervals. Driven by those requirements, Air National Guard planners in the National Guard Bureau began to "reengineer" ANG units to better participate in their expeditionary roles. The benefits of this concept became apparent in the events of the early 2000s. The Air National Guard returned to the Balkans in the mid-1990s as part of the NATO-led peacekeeping force in Bosnia, Operation Joint Guard, and its successor, Ramstein AB, Germany, to provide the necessary airlift support for U.S. military forces in Bosnia-Herzegovina and other locations across Europe. Operation Deliberate Force, was initiated in August 1995 after the Serbs shelled a Sarajevo marketplace killing 38 civilians and wounding 85 more. A contingent from the 104th Fighter Wing participated in the action. The intensity of the bombing stunned the Serbs. Coupled with victories of an American-trained Croatian-Muslim army in western Bosnia, that operation forced the Serbs to sue for peace. NATO halted the bombing on 14 September 1995, and ended Deliberate Force six days later. On 2 April 1993, NATO troops from Great Britain, France, the Netherlands, Spain, Turkey, Germany, and Italy as well as the United States launched Operation Deny Flight, a no-fly zone for Serbian aircraft over Bosnia-Herzegovina. It enforced a March 1993 UN Security Council Resolution passed to help prevent the war from spreading. The operation also provided close air support to UN ground forces serving as peacekeepers, and air strikes against Serb weapons threatening UN-designated safe areas in Bosnia. The first ANG fighter unit involved was the Connecticut Air National Guard's A-10-equipped 103d Fighter Group. Aircraft and personnel from the Maryland Air National Guard's 175th Fighter Group and Michigan Air National Guard's 110th Fighter Group joined the contingent from Connecticut. Along with unit personnel, the six Air National Guard and six Air Force Reserve A-10s returned to their home stations in mid-January 1994 after flying 520 sorties and accumulating over 1,400 hours of Deny Flight flying time. Air National Guard tanker support of Deny Flight began in June 1994 with the dispatch of 10 KC-135s and 18 aircrews from six units to Istres Air Base, France, and Pisa Airport, Italy. By the time Deny Flight ended on 20 December 1995, elements of seven Air Guard fighter and 11 air refueling units had participated in it. In July 1992 crews and C-130s from West Virginia's 167th Airlift Group inaugurated ANG involvement in Operation Provide Promise by flying food and relief supplies from Rhein-Main AB in Germany to Sarajevo, Bosnia's capital, which had a population of 380,000. That operation expanded significantly the following February to included airdrops of food and medicine to Muslim enclaves in eastern Bosnia blockaded by Bosnian Serbs. Altogether, personnel and C-130s from 12 ANG units participated in Provide Promise. During the operation, Air Force, ANG, and Air Force Reserve transports flew 4,533 sorties and delivered 62,802 metric tons of cargo. They performed airlift, airdrop, and medical evacuation missions. The Americans made a major contribution to the overall allied effort, which involved airmen from 21 nations. The humanitarian airlift operation accounted for about 95 percent of the aid delivered during the 3 1⁄2-year siege of Sarajevo. Other overseas operations during the 1990s took Air National Guardsmen to Somalia, the former Yugoslavia, Haiti, and Rwanda to augment the Air Force in a series of contingencies and humanitarian relief operations. Air National Guard and Air Force Reserve units would generally assume responsibility for an operation for 30 to 90 days, and then rotate their personnel on 15 to 30-day tours to a given location until the commitment ended. In the general military drawdown following the end of the Cold War, many European-based F-15C Eagles previously assigned to USAFE were also transferred stateside. The 101st Fighter Squadron of the Massachusetts Air National Guard received new F-15Cs that were previously with the 32d Fighter Group, Soesterberg AB, Netherlands in 1994. Other F-15A / F-15B units were upgraded to the F-15C and F-15D as they became available during the mid-1990s. Aided by the newer aircraft from the shrinking Air Force inventory, the Air National Guard modernized and reshaped its fleet after the Cold War. The size and composition of the ANG's aircraft inventory changed significantly after 1991. From 1991 to 2001 the ANG experienced an enormous growth in large aircraft including C-130H Hercules tactical airlifters, upgraded KC-135E and KC-135R Stratotankers, and B-1B Lancer strategic bombers at the expense of smaller fighter planes. One of the most critical modernization challenges facing the ANG involved its extensive fleet of older model F-16As and F-16Bs. As its goal, the ANG sought to acquire F-16C Block 25/30/32 aircraft, enabling ANG fighter units to have around-the-clock, all-weather, precision strike capabilities against surface targets. The first F-16As and F-16Bs to be retired from service entered storage with AMARC at Davis-Monthan AFB during 1993, with three aircraft from the 138th Fighter Squadron of the New York Air National Guard, followed by 17 examples from the 160th Fighter Squadron of the Alabama Air National Guard, which were updated with F-16s from the shrinking active duty force. 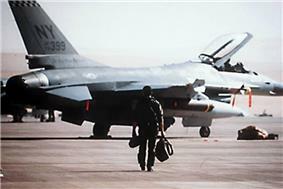 Following the first Gulf War, the Air National Guard's senior leadership in the National Guard Bureau began to adapt their organization for the post-Cold War era in a series of far-reaching discussions with top echelon Air Force personnel, state officials, unit leaders, and members of Congress. Essentially, the Air Force agreed it would attempt to retain all ANG and Air Force Reserve flying units, while reducing its own as a cost-effective way to maintain a post-Cold War force structure. However, as limited amounts of newer equipment became available from a smaller Air Force, and budgets tightened, the ANG would reduce the numbers of aircraft assigned to each unit. If necessary, it would combine units at the same locations. Some organizations would close down, but only as a last resort. After the first Gulf War ended in 1991, air power continued to play a significant role in containing Saddam Hussein's regime in Iraq, as did a naval blockade and United Nations economic sanctions. Together those forces also crippled the economic and military foundations of Hussein's power. The Air National Guard participated widely in that long campaign, which featured U.S. and Coalition aircraft maintaining two no-fly zones over portions of Iraq: Operation Southern Watch (OSW) and Operation Northern Watch (ONW). In addition, ANG units provided humanitarian aid to the Kurdish population in northern Iraq. Later deploying units to Turkey participated in Operation Northern Watch that was focused strictly on enforcing the no-fly zone above the 36th parallel in Iraq as mandated by the UN and did not include humanitarian relief for the Kurds. In a new concept at the time, relatively few ANG outfits were mobilized as units. Instead, the Air Force called up packages of equipment and personnel that were developed after the crisis began. Mobilizing entire flying units and maintaining their integrity while in federal service, although desirable, would no longer be the only acceptable approach to supporting the Air Force in a crisis. Instead the Air National Guard would be flexible in its response in order to fit the situation. That could involve individual volunteers, tailored packages of volunteers, or mobilized Air National Guardsmen developed in response to specific contingencies. Compared to previous mobilizations, ANG units and individuals during Operations Desert Shield and Desert Storm were much better prepared to perform their missions upon entry into federal service. Units were well equipped and well trained. As planned, they were able to respond much more rapidly and effectively than in previous call-ups. They were integrated into operations with their active duty and Air Force Reserve counterparts with a minimum of disruption and delay. Altogether, 12,456 Air National Guardsmen participated in Air Force operations during the Persian Gulf crisis/first Gulf War. When called upon, Air National Guardsmen were immediately prepared to perform their missions alongside their active Air Force counterparts. They did not need additional training or new equipment to do their jobs. They were integrated into most of the Air Force's operational missions, flying strategic airlift and aerial refueling sorties, and manning aerial ports. Air National Guardsmen also flew fighter, attack, aerial reconnaissance, special operations, and tactical theater airlift missions. Following the seizure of 105th Military Airlift Group of the New York Air National Guard, and the 172d Military Airlift Group of the Mississippi Air National Guard. Respectively, they flew the C-5A Galaxy and the C-141B Starlifter. see: Organization of United States Air Force Units in the Gulf War for a list of Air National Guard units. In August 1990, ANG F-15 and F-16 fighter units initiated similar rotational service for Operation Coronet Nighthawk, the successor to Operation Volant Oak, out of Howard Air Force Base, Panama. Those units monitored suspected airborne drug traffickers transiting Central America as well as the adjacent oceans. As the 1999 transfer of the Panama Canal to Panama approached, the Air National Guard began turning the operation over to civilian contractors. The last Air National Guardsmen completed their deployments to these South American sites in 1999. In December 1989 and January 1990, ANG volunteers participated in Operation Just Cause, the invasion of Panama, to secure the arrest of Panamanian dictator and accused drug lord, General Manuel Noriega. Air National Guard aircrews already deployed TDY to Howard AFB, Panama also participated in Just Cause. 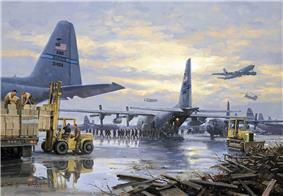 Volunteer C-130 crews completed 181 sorties moving 3,107 passengers and 551.3 tons of cargo. In addition, Air National Guard A-7 Corsair II attack jets from the South Dakota Air National Guard's 114th Tactical Fighter Group and the Ohio Air National Guard's 180th Tactical Fighter Group flew 34 combat missions in support of the invasion. However, the Air National Guard and the Total Force concept would be fully tested in the two major operations of the 1990s: Operation Desert Shield and the first Gulf War, Operation Desert Storm. The expiration of the Soviet Union, beginning with the fall of the Berlin Wall and Glasnost in 1989 and culminating in the USSR's breakup into its republics in 1991, constituted a major upheaval that continued to influence global politics into the 21st century. Instead of increasing the number of units, the National Guard Bureau authorized units to increase the number of aircraft assigned to them when the Air Force made those planes available. In 1982, the South Carolina Air National Guard's 169th Tactical Fighter Group began receiving new General Dynamics F-16A Fighting Falcons. In Air Force-wide competitions, ANG units and individuals frequently placed high or won. This was due in no small part to the ANG units being manned by more senior pilots and weapon systems officers, most of whom had recent combat experience as prior active duty officers in the Regular Air Force and who continued to hone their skills in fighter aircraft while their active duty contemporaries had to leave the cockpit for career enhancing non-flying staff assignments. The 169th Tactical Fighter Group garnered top team honors in the Air Force's worldwide gunnery contest, Gunsmoke '89. During the late 1980s, the Air National Guard's F-106 Delta Darts, F-4 Phantom IIs and A-7D Corsair IIs were being replaced by F-15A and F-15B Eagles and F-16A and F-16B Fighting Falcons as more advanced models such as the F-15C/D and F-16C/D were brought into active service with the Regular Air Force. During the 1980s, changes in the Air National Guard's force structure and readiness were primarily driven by President Reagan's military buildup and the need to prepare for a possible war between the Warsaw Pact in Central Europe. The ANG focused on modernization, more realistic combat training, increased readiness, and personnel growth, primarily in nonflying, mission support units. In 1979, Tactical Air Command assumed the atmospheric air defense mission of the United States with the inactivation of Aerospace Defense Command (ADCOM or ADC). ADC fighter interceptor units were initially realigned into a component called Air Defense, Tactical Air Command (ADTAC), at the level of an Air Division. In 1985, First Air Force (1 AF) was reactivated by TAC and given the mission to provide, train and equip ADTAC combat ready forces. Upon its reactivation, First Air Force was composed of units of both the active Air Force and the Air National Guard. In the years since its third activation, more of the responsibility for the defense of American air sovereignty was shifted to the Air National Guard. By the 1990s, 90 percent of the air defense mission was being handled by the Air National Guard. In October 1997, First Air Force became an Air National Guard numbered air force, charged with the air defense of the North American continent. In July 1972, Air National Guard units began supporting Air Force tanker task forces overseas with second-line KC-97 Stratofreighter propeller-driven tankers and volunteer crews when needed. Triggered by a 1974 decision by Secretary of Defense James R. Schlesinger to save money, the Ohio Air National Guard's 145th Air Refueling Squadron acquired the ANG's first jet tanker in April 1975 when it began converting from KC-97Ls to KC-135A Stratotankers. Altogether, the Air Force transferred 128 older KC-135s to the air reserve components to retire the slow prop-driven tankers, which modern fighters had to reduce speed to nearly stall speed in order to refuel from. In June 1979, the 137th Tactical Airlift Wing of the Oklahoma Air National Guard marked the first time an ANG airlift unit was equipped with brand new transport aircraft: it received four factory-fresh C-130H Hercules aircraft. Several years later, Congress institutionalized the practice of purchasing limited amounts of new weapons and equipment for the reserve components via National Guard and Reserve Equipment (NG&RE) funding allocations. Under the auspices of this separate appropriation for Guard and Reserve equipment established in 1982 under President Ronald Reagan, 69 brand new C-130s entered the ANG's inventory from 1984 to 1991. Starting in 1975, the ANG began conducting operations in Latin America and by the late 1970s to defend the Panama Canal and to provide training support, embassy resupply, search and rescue, and counterdrug operations. In addition, the ANG airlifted supplies and hardware to remote radar sites and performed aerial mapping operations. With the active forces being reduced after the end of the Vietnam War, a significant number of older C-130A Hercules tactical airlifters became available for the Air National Guard and Air Force Reserve, which allowed the Korean War-era C-119 Flying Boxcars and C-124 Globemasters to be retired. 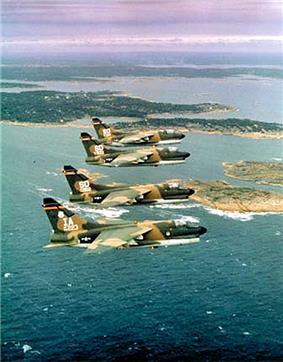 However, the Total Force Concept led to pressure to upgrade the reserve forces to front-line aircraft and beginning in 1974, new Ling-Temco-Vought (LTV) A-7D Corsair II ground attack aircraft began to be sent to Air National Guard units directly from the LTV manufacturing plant in Dallas. As A-10 Thunderbolt IIs began to replace the A-7Ds in the Regular Air Force in the mid and late 1970s, additional A-7D aircraft were transferred to the ANG. F-4 Phantom IIs began to be received by the ANG in the late 1970s with the F-15A Eagle and F-16A Fighting Falcons coming into the active inventory and ANG's F-100 Super Sabres being retired. A-7 Corsair II aircraft of the Iowa ANG and South Dakota ANG flying near RAF Waddington, UK. These aircraft were deployed to the United Kingdom from 21 August to 12 September 1979 for NATO Exercise CORONET STALLION. As part of the re-thinking of military concepts after the Vietnam War, beginning in the early 1970s with the establishment of the All-Volunteer Armed Forces, both the Air National Guard and Air Force Reserve force planning and policymaking were influenced by the "Total Force" Concept and have remained so to this day. The concept sought to strengthen and rebuild public confidence in the reserve forces while saving money by reducing the size of the active duty force. In practical terms, the Total Force policy sought to insure that all policymaking, planning, programming, and budgetary activities within the Defense Department considered active and reserve forces concurrently and determined the most efficient mix of those forces in terms of costs versus contributions to national security. The policy also insured that Reservists and Guardsmen, not draftees, would be the first and primary source of manpower to augment the active duty forces in any future crisis. 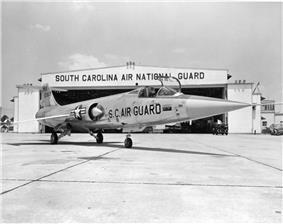 The 355th Tactical Fighter Squadron (355th TFS) in 1967 was a Regular Air Force squadron assigned to the 354th Tactical Fighter Wing at Myrtle Beach AFB, South Carolina. From January 1968 until June 1969, the 355th TFS changed from a Regular Air Force unit composed almost entirely of recent Southeast Asia (SEA) returnees to a composite squadron consisting of approximately 50% of whose personnel assets were composed of activated ANG members from the 119th TFS of the New Jersey ANG) and the 121st TFS of the District of Columbia ANG). The 355th deployed on temporary duty (TDY) to Phu Cat Air Base on 14 May 1968 with 13 of its 30 pilots being ANG members. The transfer became permanent on 26 June 1968, at which time all TDY members were offered the opportunity to volunteer for a full year's tour. All 13 ANG pilots volunteered, one of whom was killed in action a month later. By Christmas 1968, 87% of the squadron's support personnel were ANG members. 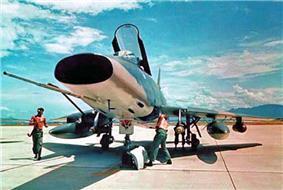 Five of the ANG pilots also volunteered as Misty Forward Air Controllers (FACs) flying the F-100 Super Sabre. In all, ANG pilots were awarded 23 Silver Stars, 47 Distinguished Flying Crosses, and 46 Bronze Stars with Combat V for valor while stationed at Phu Cat. In July 1970, two EC-121 "Super Constellations" from Pennsylvania's 193d Tactical Electronic Warfare Squadron departed their home station for Korat RTAFB, Thailand. During the next six months, approximately 60 Air National Guardsmen were rotated through the latter installation on 30 to 60-day tours in Operation "Commando Buzz," their aircraft serving as flying radar stations and airborne control platforms for U.S. air operations in SEA until January 1971. However, after the 1968 Tet Offensive in which the Communist North Vietnamese and Vietcong troops attacked positions throughout the Republic of Vietnam, the Pentagon dispatched four Air National Guard fighter squadrons to that nation. In addition, the Pueblo Crisis in Korea also saw mobilized Air Force Reservists, Air National Guardsmen and Naval Reservists. That crisis prompted the third partial Air National Guard mobilization since the end of World War II, and eventually two ANG fighter squadrons were dispatched to South Korea. However, the Pueblo crisis ended without a resort to combat. Air National Guard airlift units, however, began flying regularly to Japan and South Vietnam beginning in 1966 to support Military Airlift Command (MAC) operations. These flights continued on a regular basis until 1972. In addition, between August 1965 and September 1969, Air National Guard domestic and offshore aeromedical evacuation flights freed active duty Air Force resources for such missions in Southeast Asia (SEA). The Vietnam War provided the next significant test for the Air National Guard. However, for largely domestic political reasons, President Lyndon B. Johnson chose not to mobilize most of the nation's reserve forces before 1968. His reasons for not mobilizing reserve forces were many. Primarily, he did not believe that the war in Vietnam justified the dramatic act of mobilizing Reserve and National Guard forces. He accepted the need to fight the war, but he wanted to prosecute it as quietly as possible, not attracting too much attention at home and risk jeopardizing his domestic programs. He also wanted to avoid drawing the Communist Chinese into the war or the attention of the Soviet Union, the latter which might view the mobilization of Reserve and National Guard units as "escalatory" within a larger Cold War context. Moreover, recalling Reservists' complaints of inactivity following the Berlin mobilization of 1961, he was also reluctant to recall Reservists and National Guardsmen without the assurance that their employment would significantly affect the course of the war, an assurance no official in his administration could provide. As a result, even though still populated by many World War II and Korean War combat veterans, the Reserves and the National Guard acquired ill-deserved reputations during this period as havens for relatively affluent, young white men with no prior active duty military service as a means to avoid the draft. With the Regular Air Force tanker fleet being used more and more in Southeast Asia after 1965 to support combat operations in South Vietnam, and the demands of the Strategic Air Command (SAC), which performed the nuclear deterrence mission, both volunteer Air Force Reservists and Air National Guardsmen in air refueling units participated in worldwide air refueling missions during their Annual Training or other additional active duty periods in order to supplement the active duty tanker force. The Texas Air National Guard's 136th Air Refueling Wing inaugurated Operation Creek Party on 1 May 1967, because the Regular Air Force did not have enough KC-135 Stratotanker aircraft available in Europe to train its fighter pilots in USAFE. The operation eventually involved nine ANG air refueling groups that rotated approximately every two weeks to Rhein-Main Air Base in West Germany. As a result of these two Cold War incidents, from January through December 1963, for the first time Air National Guard airlift units began routinely deploying overseas during their annual training periods, primarily to Europe, to exercise their wartime missions. Air National Guard transport units hauled cargo for the Military Air Transport Service (MATS) while training for their wartime global airlift role. By August 1962, the units mobilized for the Berlin Crisis returned to state control. They had hardly resumed normal operations when President Kennedy announced on 22 October 1962 that the Soviet Union had placed nuclear warheads in Cuba, only 90 miles from Florida. With the Cuban Missile Crisis, Air National Guard fighter units trained for "no notice" deployments, and volunteer ANG airlift crews and their aircraft augmented Air Force global airlift operations. Air National Guard bases hosted Air Force fighters and bombers dispersed there to avoid a possible Soviet nuclear response to the crisis. But in the end, no ANG unit was federalized. An F-104A Starfighter interceptor from the 157th Fighter-Interceptor Squadron, South Carolina Air National Guard, is loaded aboard a C-124 Globemaster II for shipment to Europe during the Berlin crisis, 1961. President John F. Kennedy mobilized a limited number of Reserve and Guard units, dispatching 11 ANG fighter squadrons to Europe. All the Guard units were in place within a month of their respective mobilization days, although they required additional training, equipment, and personnel after being called up. In all, some 21,000 Air Guardsmen were mobilized during the 1961 Berlin Crisis. World War II had left the city of Berlin 100 miles deep within East German territory, controlled by the Soviet Union, and divided into Soviet, British, French, and United States zones of occupation, administered under local agreements which did not guarantee Western access to the city. Responding to a series of Soviet actions in 1948, the three western allies consolidated their zones and formed the city of West Berlin. For fifteen years the western powers maintained a tenacious hold on West Berlin under periodic harassment of the Soviets. On 13 August 1961, Berliners woke up to find they lived in a divided city. A wall now separated East Berlin from West Berlin. With that provocative act, the Soviet Union ratcheted up the Cold War. Additionally, the Air National Guard also took on an air refueling mission. 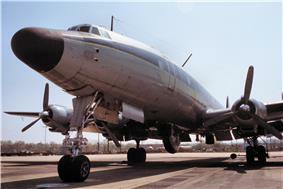 The Air National Guard received its first KC-97 Stratofreighter aerial tankers in July and August 1961. During that period, the 108th Fighter-Interceptor Squadron in Illinois, the 126th Fighter-Interceptor Squadron in Wisconsin, and the 145th Air Transport Squadron in Ohio, converted to KC-97Fs and were redesignated air refueling squadrons. 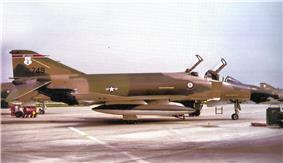 The ANG considered replacing the fighter squadrons in these instances with transport aircraft a viable option for overcoming runway issues or community objections and also was a way to keep experienced senior aviators in the cockpit. 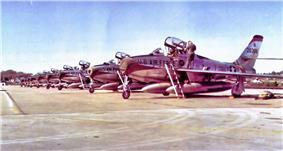 During the late 1950s, the Air Force allowed several Air National Guard units to trade in their aging piston-driven fighters for second-line transports. New Jersey's newly organized 150th Air Transport Squadron (Light) became the first pure airlift unit in the Air National Guard on 1 February 1956. It received Curtiss C-46D Commandos. Two other aeromedical transport squadrons followed that year, primarily because of the impracticality of converting their locations to modern jet fighter operations. In 1959, the Air Force, in order to save operating funds, planned to phase out 48 C-97 Stratofreighters before their replacements were available to the active force. The Air National Guard requested these aircraft be sent to ANG units, and in January 1960, units in California, Minnesota, New Hampshire, New York, and Oklahoma began trading in their obsolete fighters for C-97s. 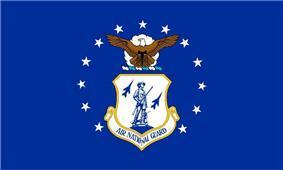 Originally the Air National Guard was designed as a combat reserve force. After World War II, its flying units consisted of 72 fighter and 12 light bomber squadrons equipped with obsolescent World War II propeller-driven aircraft while the active duty Air Force transitioned to jet fighters. Although it had no airlift or tanker units, the Air National Guard's flying units were equipped with a small number of liaison, trainer, and transport planes, and the Air National Guard actively sought out new missions and aircraft. Using Air National Guardsmen from the 138th Fighter-Interceptor Squadron at Hancock Field, Syracuse, New York, and the 194th Fighter-Bomber Squadron at Hayward, California, the experiment began on 1 March 1953. It proved a great success and in August eight squadrons began "standing alert" using volunteer aircrews on a rotating basis for 14 hours a day. In October, nine more squadrons joined the program. The ANG runway alert program required some planes and pilots to be available around-the-clock to become airborne within minutes of being notified to scramble. At its peak in the mid-1950s, all 70 Air National Guard fighter squadrons participated in that program, although that number was reduced to 25 by 1961 due to budget constraints. Most of the runway alert exercises involved interceptions of SAC bombers; although a few actual scrambles turned out to be interceptions of late or off-course commercial airliners. The runway alert experiment in 1953 marked the beginning of the Air National Guard's modern homeland defense role. Moreover, it was the first broad effort to integrate reserve units into a major Air Force combat mission in peacetime on a continuing basis using volunteers. The Air Division chief at the National Guard Bureau wanted to find an innovative way to provide additional training for fighter pilots after their units were demobilized. At the same time, Air Defense Command could not call upon sufficient active duty Air Force units to defend the continental United States against the Soviet air threat. It was proposed to employ ANG pilots full-time from "strategically placed" Air National Guard units to perform "air intercept missions" against unidentified aircraft entering United States air space. In addition they would "provide simulated fighter attacks against the Strategic Air Command's nuclear-capable bombers." Although Korean War hostilities ended in July 1953, the Cold War with the Soviet Union persisted. The initial mobilization fiasco forced the Air Force to achieve an accommodation with the Air National Guard and to thoroughly revamp its entire reserve system. Because of the problems associated with the Korean War mobilizations, the Air Force and its reserve components pioneered new approaches like the runway alert program to reserve training and management. With the reinforcement of the Far East Air Forces (FEAF), Air National Guard squadrons were deployed to Europe in late 1950, being assigned to newly constructed bases in France as part of Alaska, Newfoundland, Europe, and French Morocco. Eventually, they made substantial contributions to the war effort and the Air Force's global buildup. In the Far East, the ANG's 136th and 116th Fighter-Bomber Wings compiled excellent combat records flying F-84 Thunderjets. Air Guardsmen flew 39,530 combat sorties and destroyed 39 enemy aircraft. But, 101 of them were either killed or declared missing in action during the conflict. Four Air Guardsmen—Captains Robert Love (California), Clifford Jolley (Utah), and Robinson Risner (Oklahoma), plus Major James Hagerstrom (Texas) – became aces, with some, such as Risner, later transferring to the Regular Air Force. Largely as a result of the Korean War experience, senior ANG and Air Force leaders became seriously committed to building the Air National Guard as an effective reserve component. During the Korean War, some 45,000 Air Guardsmen, 80 percent of the force, were mobilized. That callup exposed the weaknesses of the United States military reserve programs, including the ANG. Sixty-six of the Air Guard's ninety-two flying squadrons, along with numerous support units, were mobilized. Once in federal service, they proved to be unprepared for combat. Many key Air Guardsmen were used as fillers elsewhere in the Air Force. It took three to six months for some ANG units to become combat ready. Some never did. Captain John McMahn and Sergeant White, of the 182d Fighter-Bomber Squadron, Texas Air National Guard, close out flight records at Taegu AB (K-2), South Korea, following their F-84E Thunderjet becoming the first such aircraft to complete 1,000 flying hours, 1952. After World War II, the Air National Guard developed an unfortunate reputation as a glorified "flying club" for World War II combat veterans. Not only did the units and individuals lack specific wartime missions, their equipment, especially aircraft, was obsolete and their training was usually deplorable. Once mobilized, those Air National Guardsmen proved to be almost totally unprepared for combat. Regardless of their previous training and equipment, Air National Guard units were assigned almost at random to major air commands. It took months and months for ANG units to become combat ready; some units never succeeded. At the end of October 1950, the Air National Guard converted to the wing-base (Hobson Plan) organization. As a result, the former Army Air Force Wings which were allocated were inactivated by the National Guard Bureau returned to the control of the Department of the Air Force on 31 October 1950. The personnel and equipment of the inactivated wings were transferred to new Air National Guard wings which were established, recognized and activated on 1 November 1950. 18 September 1947, however, is considered the Air National Guard's official birth, concurrent with the establishment of the United States Air Force as a separate branch of the United States military under the National Security Act. The postwar Air National Guard force of the late 1940s included 58,000 members. Between 1946 and 1949, all of the initial allotment of units received federal recognition in the CONUS. The Hawaii Territory ANG received recognition and was activated on 4 November 1946; the Puerto Rico ANG on 23 November 1947, and the Alaska Territory ANG on 15 September 1952. Individual state squadrons were assigned to either Groups or Wings, depending on circumstances, allocations, and gaining commands of the Army Air Forces. As individual units were organized, federally recognized, and activated, the Army Air Forces provided them airfields, equipment and surplus aircraft. Once formed, the units began obtaining federal recognition, and the state Air National Guard units were established. 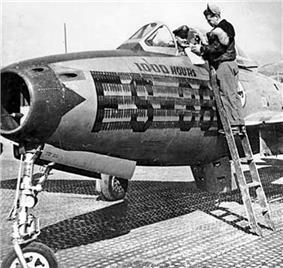 Its primary units were 84 flying squadrons, mostly equipped with F-51 Mustang and F-47 Thunderbolt fighters with air defense of the continental United States as their main mission, its units under the jurisdiction of the USAAF Air Defense Command. Tactical Air Command also had several ANG units being assigned B-26 Invader medium bombers. On 21 August 1946, inactivated USAAF group and squadron designations were transferred from the Department of the Army to the National Guard Bureau. The units were re-designated with unit designations within the 101–299 range and allotments were made to Adjutant General of the states and territories whose mission it was to organize the units being allocated and prepare them for federal recognition by the NGB. As the wartime Army Air Forces demobilized in 1945 and 1946, inactivated unit designations were allotted and transferred to various State and Territorial Air National Guard bureaus to provide them unit designations to re-establish them as Air National Guard units. 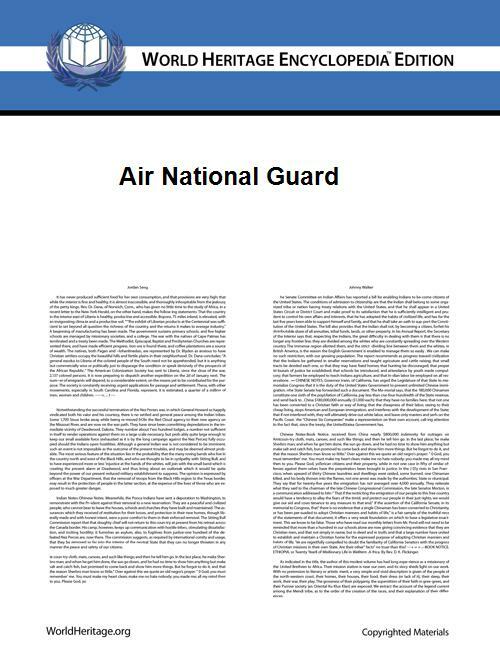 Initially, the National Guard Bureau (NGB) developed a table of organization for the Air National Guard to include at least one unit allocation per state. In addition, the territories of Alaska, Hawaii and Puerto Rico were allocated one unit designation each. A table of organization was developed in which a series of twelve ANG Wings were allocated to provide command and control over separate regions of the United States; each Wing controlled three or four Groups within the region, and the Groups controlled squadrons within the region, sometimes distributed over several states. Determined to include an Air Force National Guard in the postwar U.S. military establishment during World War II, the National Guard Association of the United States flexed its considerable political muscle. It compelled the Harry S. Truman instituted dramatic postwar military budget cuts, he split defense dollars evenly among the Army, Navy, and Air Force. That move also required the Air Force to plan for a far smaller active duty service than it had envisaged. As a result, the Air Force needed both reserve components, the Air National Guard and the Air Force Reserve, to help fill the gap. The Air National Guard as we know it today, a separate reserve component of the United States Air Force in addition to the purely "federal" Air Force Reserve, was a product of the politics of postwar planning and inter-service rivalry during World War II. The Army Air Forces leaders who planned and maneuvered for an independent postwar Air Force during World War II had little confidence in the reserves of the U.S. Army, especially the state-dominated National Guard. On the contrary, those leaders expected to build the largest and most modern standing air force possible. However, domestic politics and American history forced them to significantly alter their plans. Following a devastating blizzard in 1949, Colorado Air Guard C-47s dropped hay to stranded and starving livestock throughout the Rocky Mountain region. Altogether the Colorado Air Guardsmen flew 17 such missions dropping tons of hay that saved thousands of cattle and wildlife. 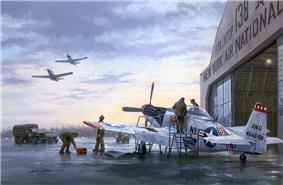 Colorado Air Guard F-51s and A-26s also flew 10 reconnaissance missions during that emergency, 29 January 1949. The units were transformed from observation organizations into reconnaissance, liaison, fighter, and bombardment squadrons. They served in every major combat theater during the war. The most significant wartime contribution of National Guard aviators was to train and lead the large numbers of volunteer airmen who had entered the AAF. That role was epitomized by Lt Col Addison E. Baker, a Guardsman from Akron, Ohio. On 1 August 1943, Baker commanded the VIII Bomber Command's 93d Bombardment Group on a daring but ill-fated low-level attack against enemy oil refineries at Ploesti, Romania. Baker was posthumously awarded the Medal of Honor for his heroic leadership. After the World War II. An aviator in the 110th Observation Squadron of the Missouri National Guard (1923–1943) became the most famous Guard pilot during the interwar period: Captain Charles A. Lindbergh. His service illustrated the close ties between military and commercial aviation. Trained to fly by the Army, he joined the 110th Observation Squadron in November 1925. The following year, he became chief pilot for an airmail venture started by fellow 110th pilots Major William Robertson and his brother Frank. 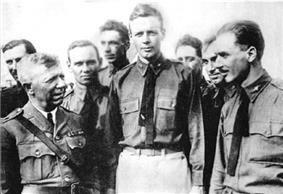 After Lindbergh made his historic solo trans-Atlantic flight in May 1927, he recalled his service in the Guard fondly. After the war, National Guard aviation was placed on a permanent basis over the initial opposition of the Army's General Staff. In 1920, the 109th Observation Squadron of the Minnesota National Guard (1921–1941) became the first post World War I air unit to receive federal recognition. During the interwar period, 29 observation squadrons were established. They were either integral elements of National Guard infantry divisions or assigned to Army corps aviation. When the United States entered World War I in April 1917, the War Department decided that it would not mobilize National Guard air units. Instead, individual Guard volunteers provided a major pool for the Army to draw aviators from. They were required to leave the Guard and enter the Signal Corps Reserve if they wished to fly in the war. About 100 National Guard pilots joined the newly formed United States Army Air Service. Guardsmen also played prominent roles in air operations in France. On 14 April 1918, Tennessee Guardsman Reed Chambers flew with Eddie Rickenbacker and David Peterson of the 94th Pursuit Squadron from Villeneuve, France on the first combat mission ever ordered by an American commander of a U.S. squadron of American pilots. At least four Guardsmen—Chambers, Field Kindley (Kansas), Reed Landis (Illinois), and Martinus Stenseth (Minnesota) – became aces. 2d Lieutenant Erwin R. Bleckley of Kansas was awarded the Medal of Honor posthumously for his heroism as an aerial observer. After the armistice and the return of the American Expeditionary Force in 1919, the wartime squadrons were demobilized and inactivated. During the Mineola, Long Island. It is recognized as the ANG's oldest unit and its lineage is carried by the 102d Rescue Squadron, New York ANG. On 13 July 1916, the 1st Aero Company mobilized during the border crisis with Mexico. the unit was called into federal service when the Mexican revolution spilled over the border into the United States. Bolling's unit was joined at Mineola by the 2nd Aero Company of Buffalo and 12 Guard officers from other states. Both air units remained at Mineola during the crisis. In April 1908, a group of enthusiasts organized an "aeronautical corps" at the Park Avenue Armory in New York City to learn ballooning. They were members of the 1st Company, Signal Corps, New York National Guard. Although they received instruction and assembled a balloon, it was not clear whether members of the unit had ever actually ascended in it. In 1910 the unit raised $500 to finance its first aircraft.